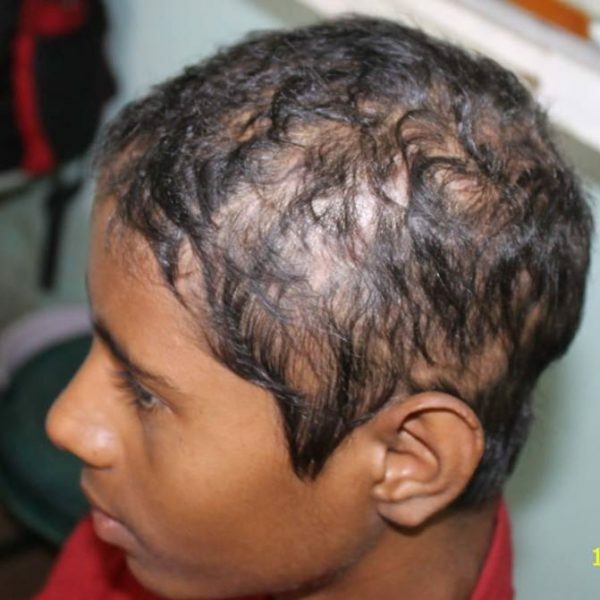 Israr Ahmed came to consult at Dr. Ravi Balrampur clinic on 14th June 2014, his head was suppurated there was pus formation in it. 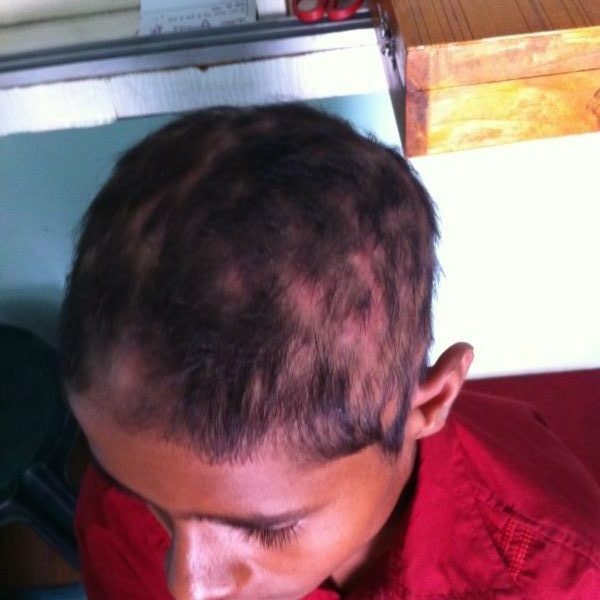 He was in a painful state and he was too young to go through from such pain. 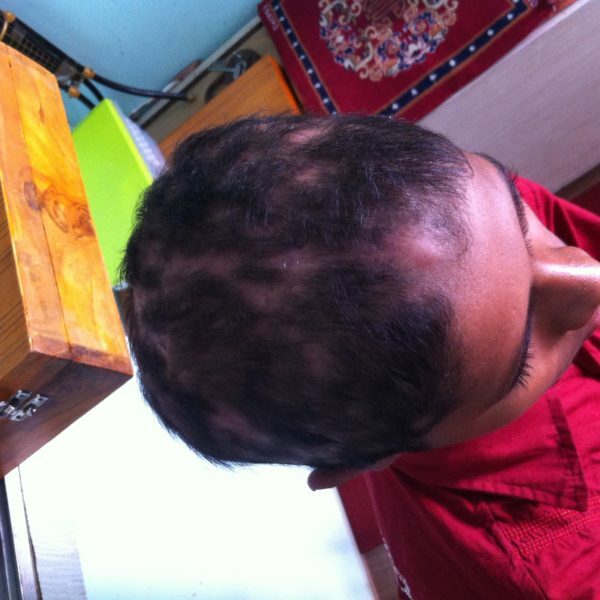 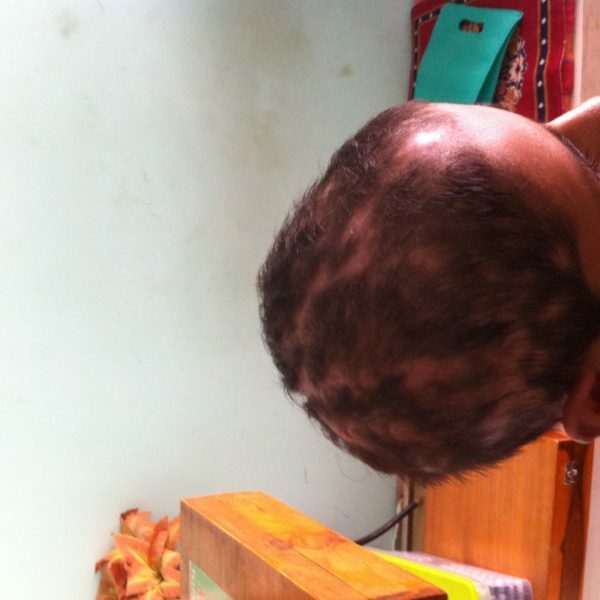 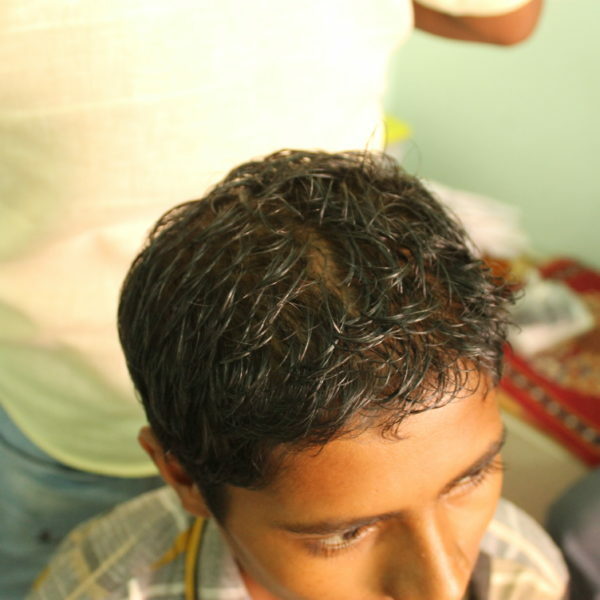 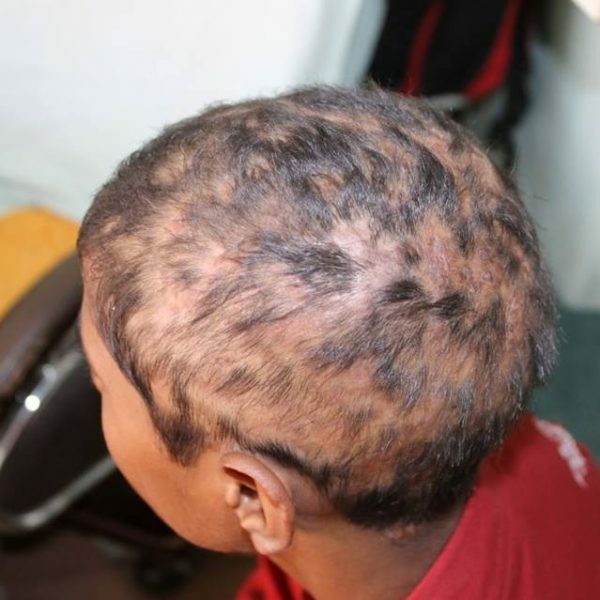 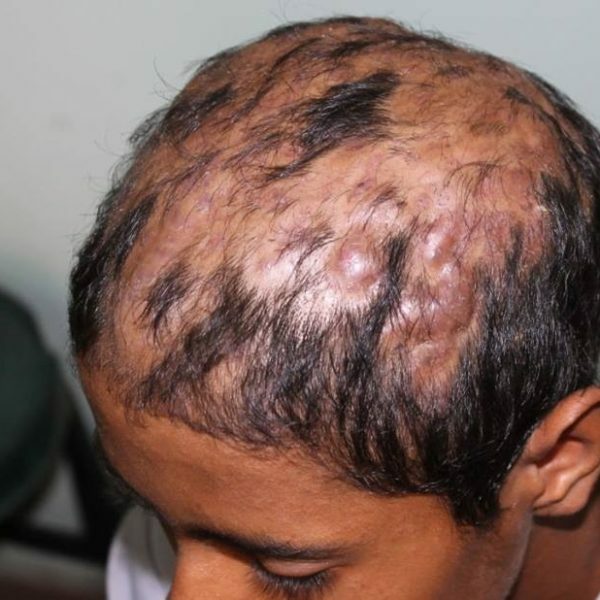 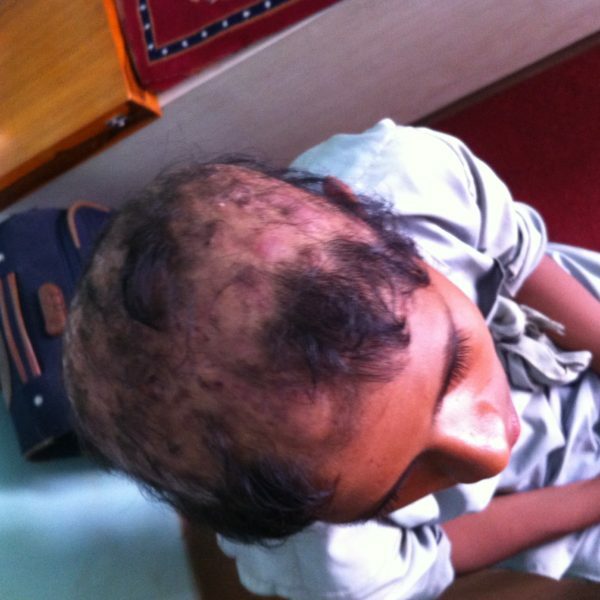 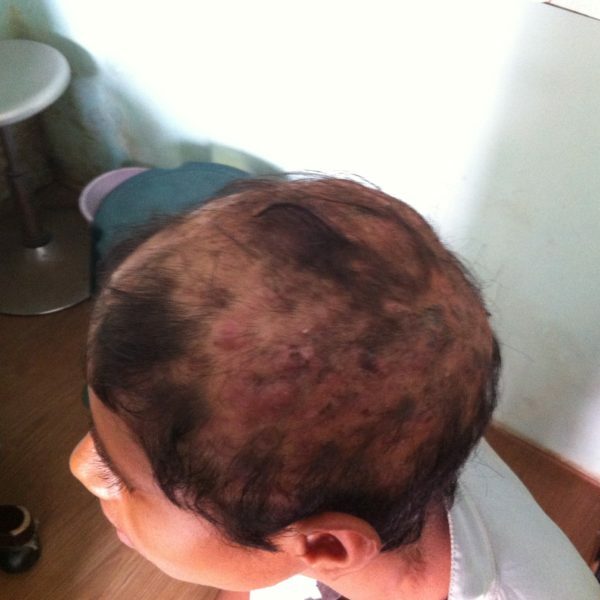 Dr. Ravi diagnosed it as folliculitis decalvans, it is a form of alopecia (hair loss) that involves scarring. 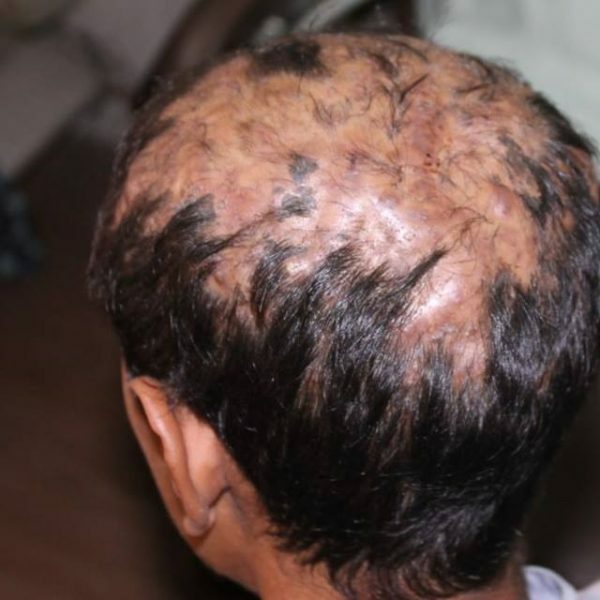 It is characterized by redness and swelling and pustules around the hair follicle that leads to a destruction of the follicle and consequent permanent hair loss. 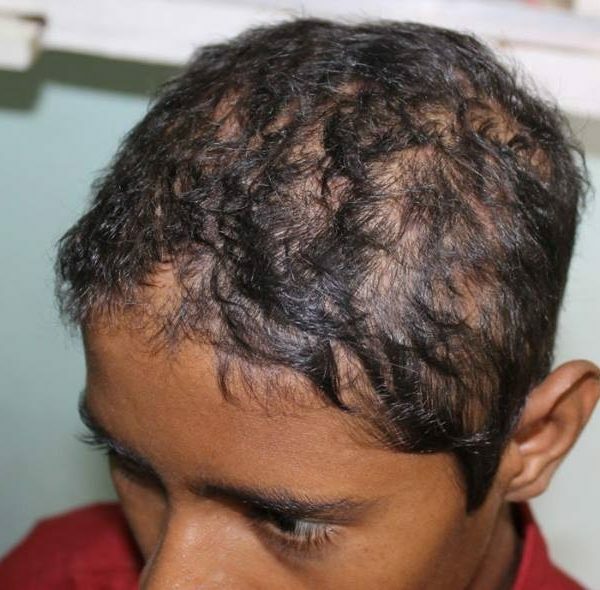 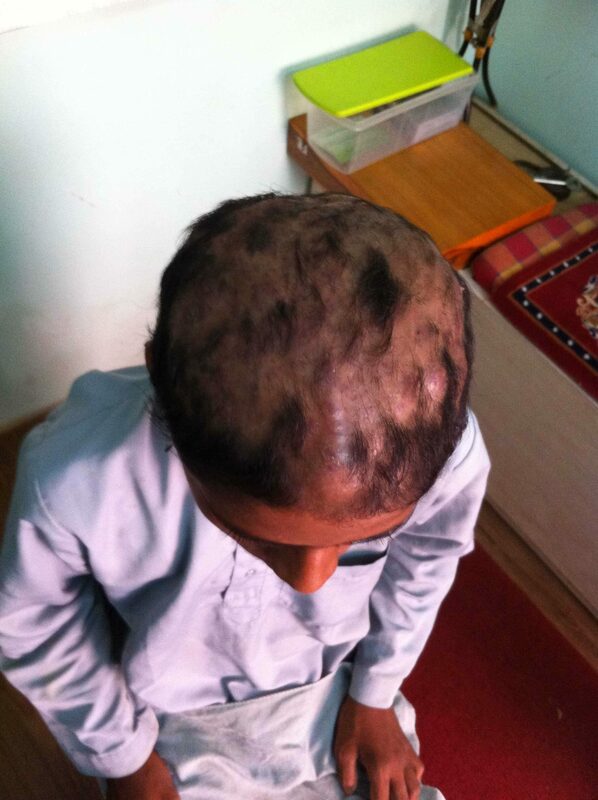 On asking how this problem started, his father told that it started 3 months ago with one follicle and in few days there was a big patch and there was lot of pain and itching. There was redness, swelling and pustules formation containing fluid and pus all around in the form of a patch and there was hair loss in that area. 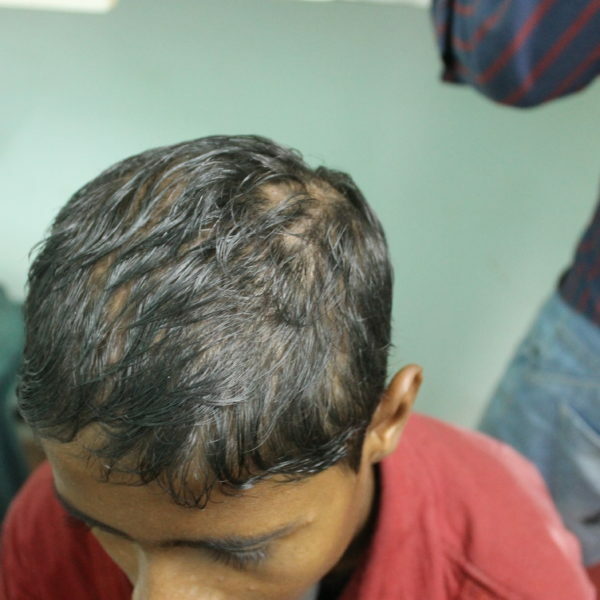 It started spreading all over resulting hair loss and no hair growth can be seen in that area. 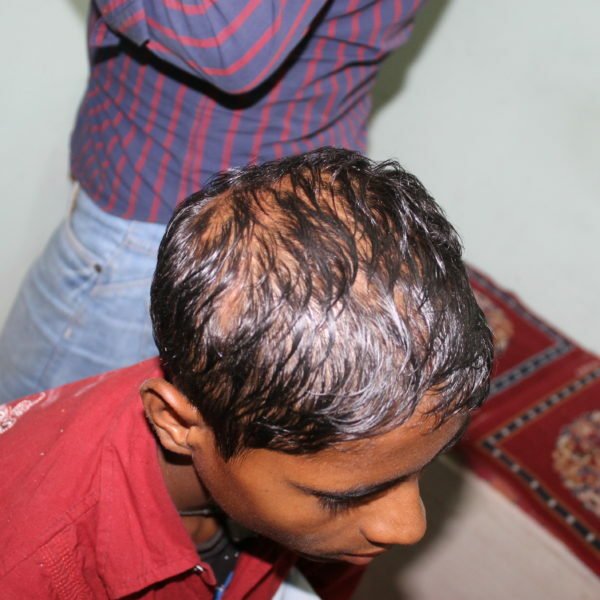 So much pain and trouble for a boy at this young age was really painful. 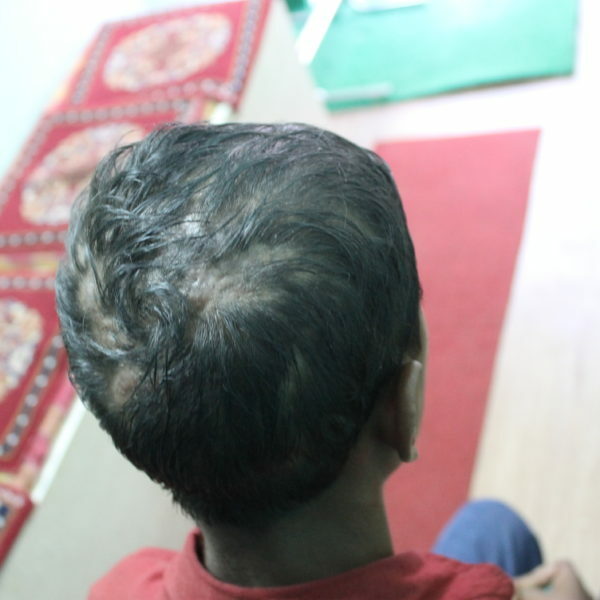 His parents were worried about his condition as they can’t see him suffering so much. 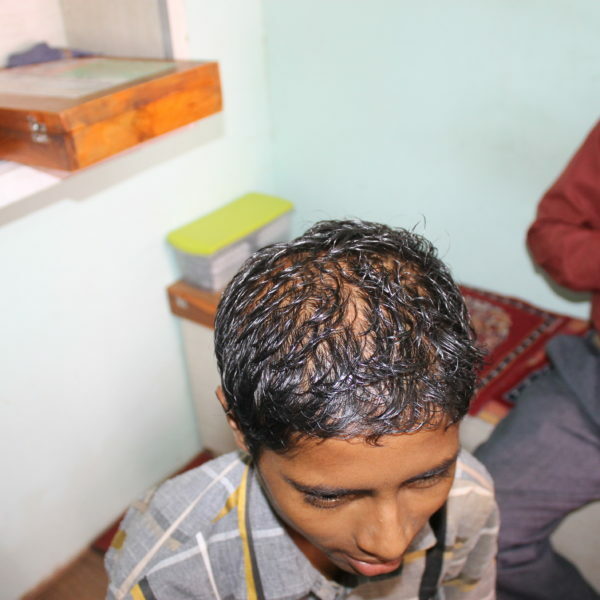 Dr. Ravi started treatment process. 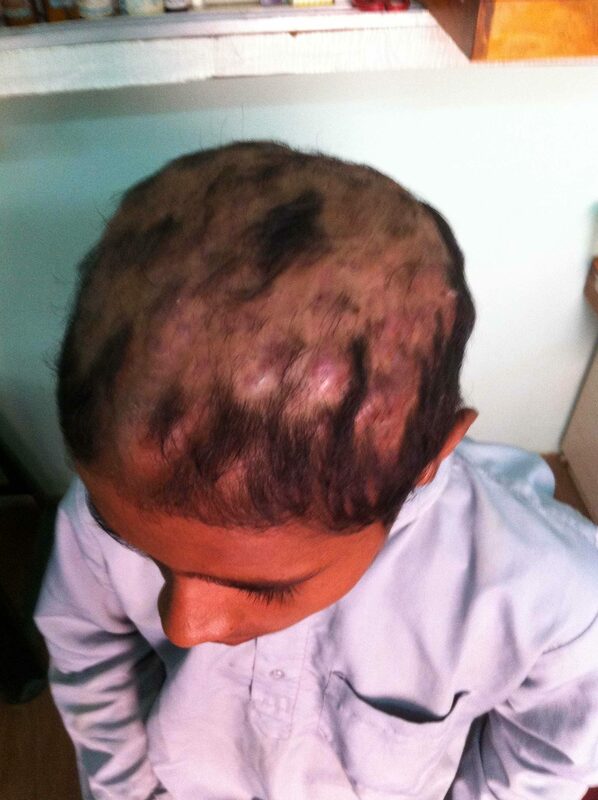 When he came for follow up on 12th July 2014, there was the improvement in itching. 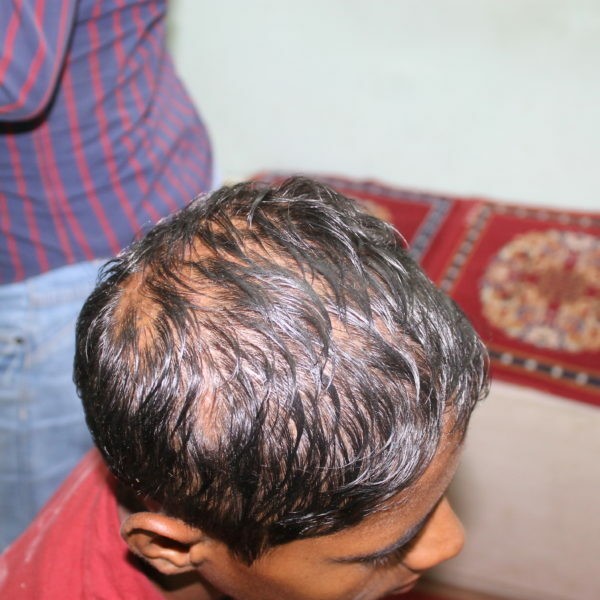 Previously there was a lot of itching which resulted in bursting of pustules. 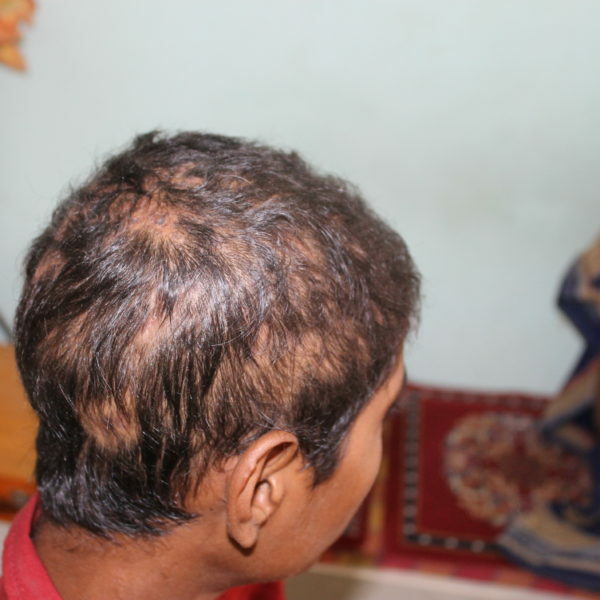 No new follicles were seen from the day his treatment has been started. 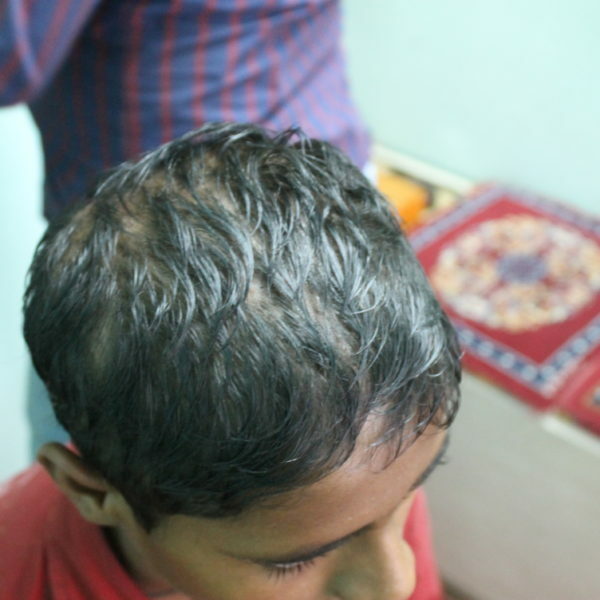 When he came for follow up on 15th Aug 2014, no new follicles were seen. 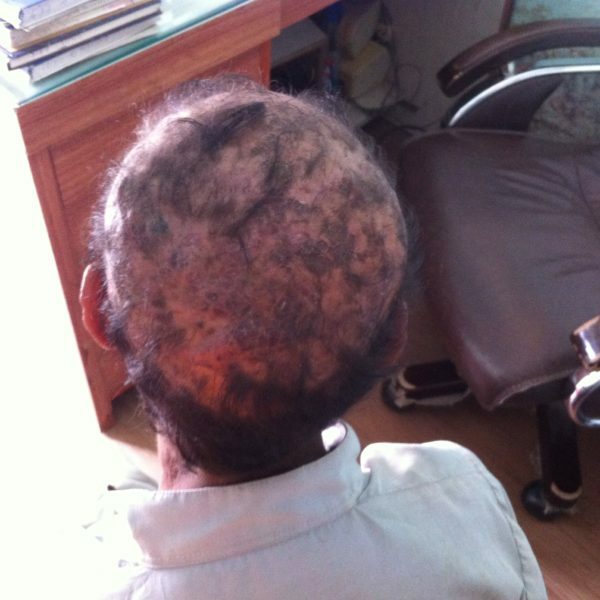 The existed patches with pustules started drying. 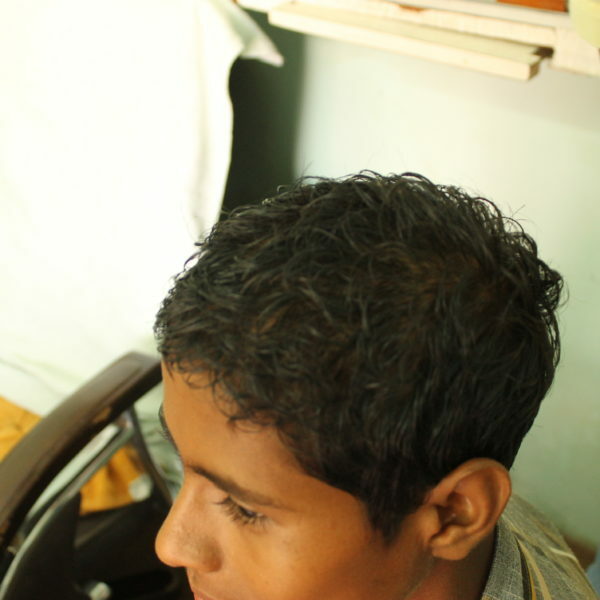 There is relief in pain and itching. 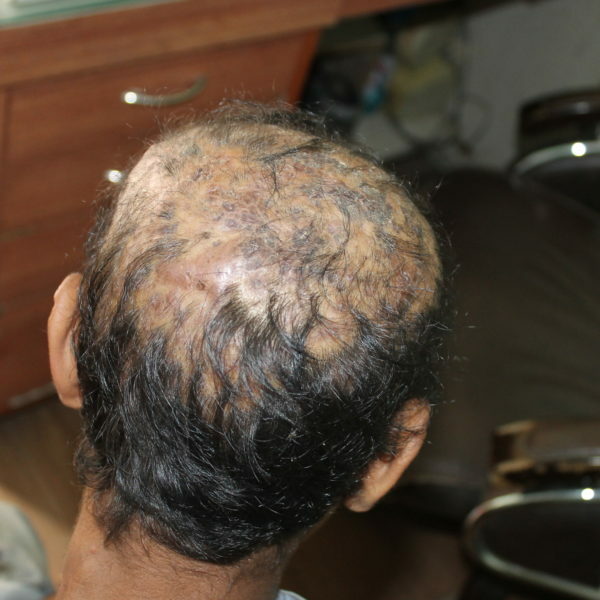 New grown hairs are seen and Dr. Ravi suggested to continue treatment for better recovery. 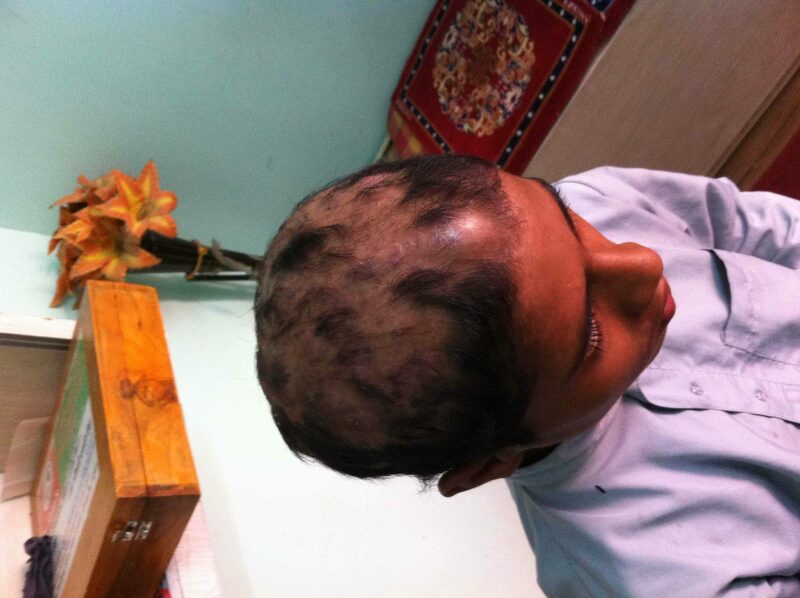 When he came for follow up on 13th Sep 2014, a good recovery has observed and there was relief in his condition. 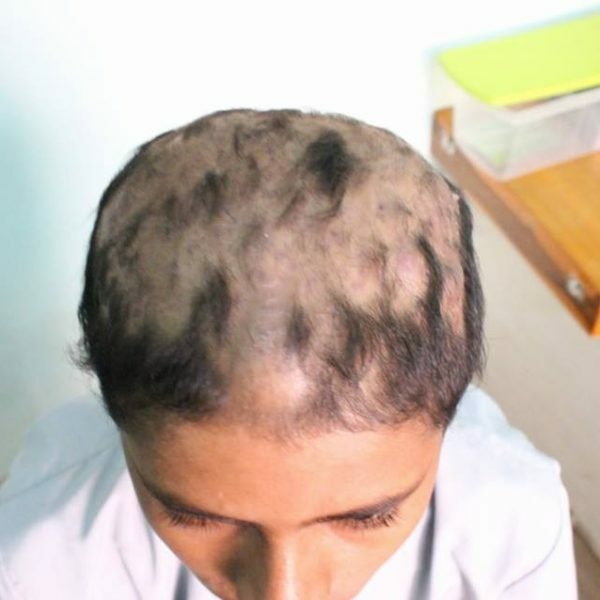 All the patches with the combination of follicles dried and there is no pain and itching noticed. 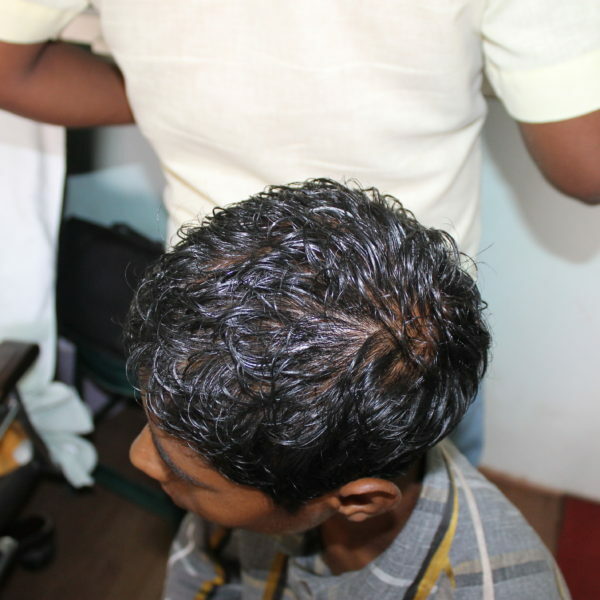 The good part is that there are new hairs and any new follicles are not seen. 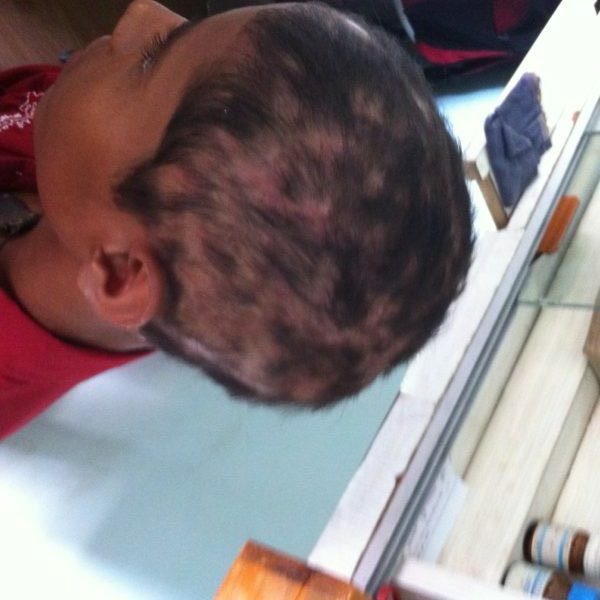 There were no complaints and this boy and his parents were thankful to Dr. Ravi for helping him to get rid of this horrible disease. 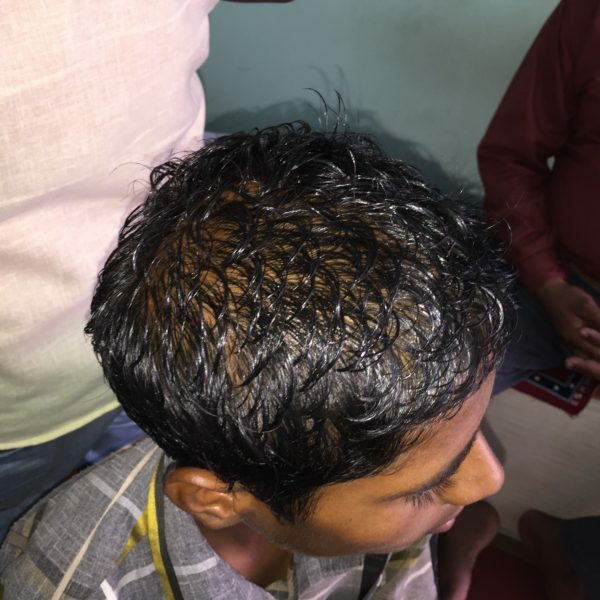 When he came for follow up on 10th Oct 2014, he had no complain and no new follicles were seen. 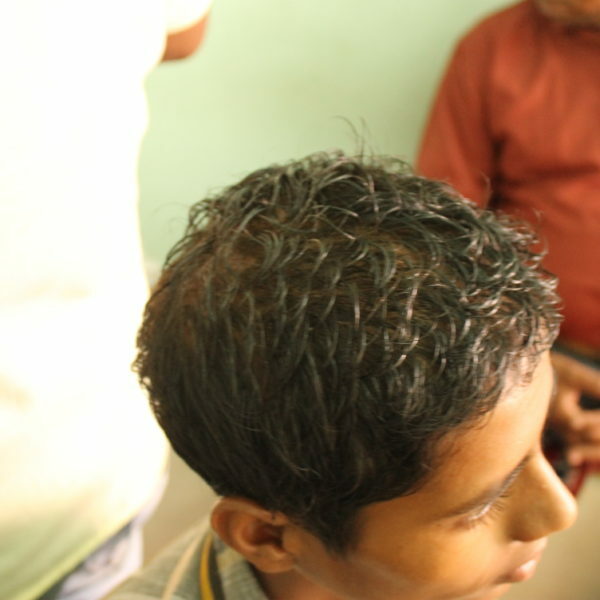 There was a lot of hair growth and hairs had started covering the bald patches. 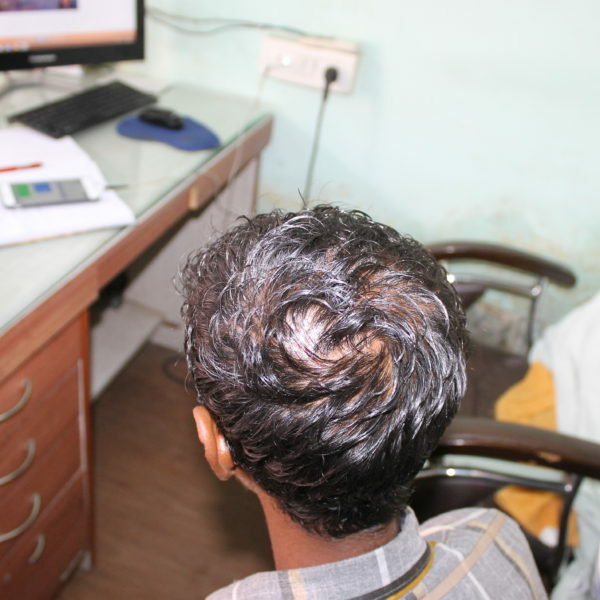 Dr. Ravi called him for follow up on 29th August 2015 to see if there was any recurrence. 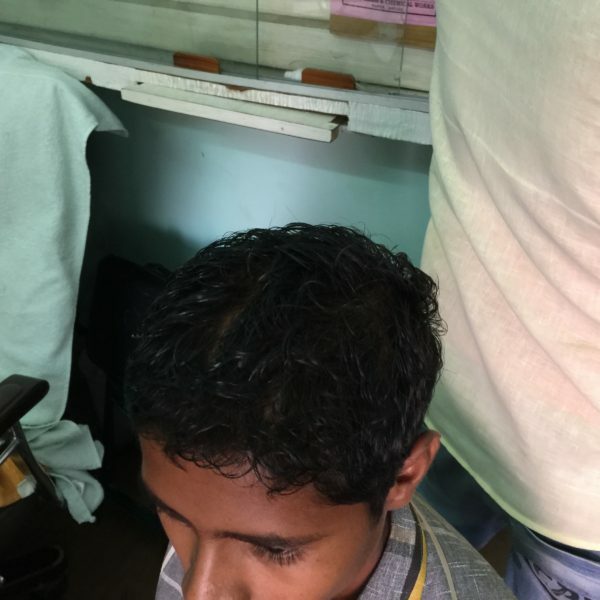 This time he came with full hair growth and no bald patches were visible. 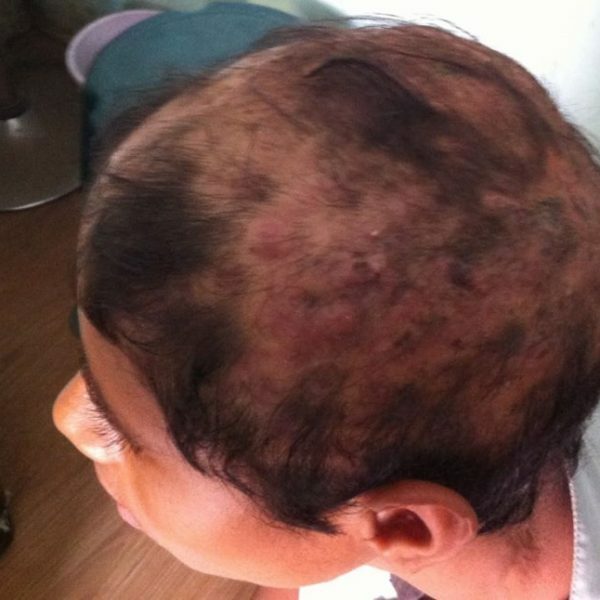 He was totally cured of folliculitis decalvans and there was full hair growth and no new follicles seen. 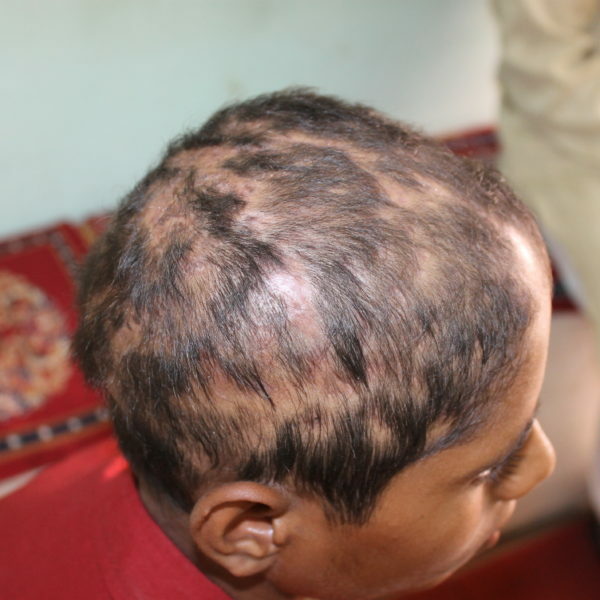 He was happy with the treatment and thankful to Dr. Ravi for helping him to completely get rid of this disease.